Description/Brief Summary: Thirty-one questions about time and seasons are asked and answered in this book. An index provides a great way for readers to look up topics of interest without reading the book from cover to cover. The colorful illustrations aid in understanding the text. When you look at a sunrise, do you wonder and ask why it's appearing at a certain time? Are you curious about why we have seasons? How can you tell time without a clock? 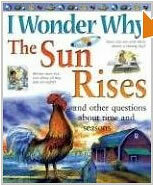 This book is filled with questions and answers about sunlight, time and seasons. The author, Brenda Walpole, gives easy-to-understand explanations to describe what is happening and why. I recommend to this book to anyone who wants to learn more the science of sunlight, time, and seasons. But be warned, you'll be left with more questions! You'll be ready to start your own search for other scientific explanations about what you see happening all around you.